Godinton house and gardens are set in a beautiful 18th century landscaped park with views across the countryside to Great Chart church to the south. 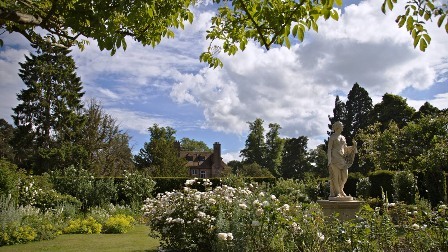 The gardens were designed by the architect Reginald Blomfield at the turn of the 20th century and include terraced lawns, topiary, formal pond and rose garden all surrounded by a vast yew hedge and ornamented with impressive statuary. In contrast to Robinson and Jekyll&apos;s natural planting principles, Blomfield created a strict distinction between garden and countryside bringing ‘house and garden into harmony, to make the house grow out of its surroundings’. The additions of herbaceous borders and tree planting by subsequent owners have modified and softened the original design. A small walled Italian garden with central fountain and scented mediterranean planting looks out over the wild garden. The 18th century walled kitchen garden contains delphinium borders, potager planting, ornamental, alpine and fern houses. Goodnestone Park is a handsome 18th century house and parkland where Jane Austen frequently visited her brother who grew up there. Old trees, the walled garden and some terracing survive from the 18th and early 19th centuries. A woodland garden dates from the early part of the 20th century. Wonderful plantsman&apos;s gardens have been developed over the last 50 years, in the walled kitchen garden and surrounding woodlands. The award-winning formal gardens at Groombridge Place comprise a series of outdoor rooms, each with its own colour scheme. Through the seasons, each space offers a new highlight: cherry blossom, wisteria, roses and golden autumn foliage. 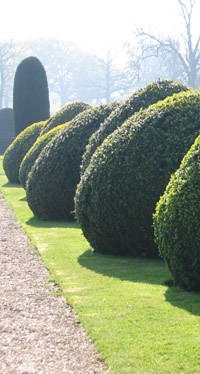 Behind the delightful 17th century house are terraces originally designed by the gardener and diarist, John Evelyn (1620-1706), containing clipped topiary, urns and statues which have remained more or less unchanged since the 17th century. During the 18th and 19th centuries many trees were planted, and in the late 20th century the Knot garden, the White garden and the Peacock Walk were added. There is also a woodland valley for children designed by the landscape designer Ivan Hicks. The estate also has its own small vineyard and a deer park.